Apple has also launched Mac Mini 2018 with the iPad Pro and the new MacBook Air on Tuesday in New York. There was no change in the design of Mac Mini since 2014. Apple says the performance of the new Mac Mini is up to 5 times faster than the previous model. Apart from this, there will be up to six-core processors, up to 64 GB of RAM and flash storage options in select countries. Like the MacBook Air, Mac Mini 2018 also used the Apple T2 security chip. Let's take a look at the main feature of iPad Pro. Apple's new iPad Pro slim design, thin bezel, no home button, face ID technology, apple A12x bionic chip, USB type-c port, and seven-core applet graphics chip. The 11-inch and 12.9-inch models of the iPad Pro will come in 64 GB, 256 GB, 512 GB, and 1 TB storage variant. 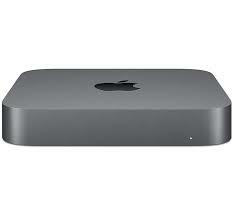 Price, Availability, and Specifications of Mac Mini in IndiaThe initial price of the Mac Mini is $ 799 (about Rs 58,800). In the US and India, the sale of Mac Mini will begin on November 7. In India, the initial price of Mac Mini is 75,900 rupees. The 2018 Mac Mini will be the quad-core or six-core 8th generation Intel Core processor (Turbo Boost's highest speed of 4.1 GHz). Only 8 GB RAM variants will be sold in India. Apart from this, customers will also get the facility of up to 2 TB of SSD storage, while in India only 128 GB and 256 GB storage variants will be available. Apple has included four Thunderbolt 3 USB Type-C (version 3.1) ports, an HDMI 2.0 port, two USB Type-A (version 3.0) ports, audio jack and gigabit ethernet in Mac Mini. The Mac Mini will come with 4K and 5K Thunderbolt display support. Apple will bring two variants of Mac mini in India, both models will be sold in space gray. The initial model has 3.2 GHz quad-core Intel Core i3 processor, 8 GB RAM (2666 MHz) and 128 GB SSD storage. Price of the most expensive variant of Mac Mini in the US is $ 1,099, but the price of this variant has yet to be exposed in India. This model will have a 3.0 GHz 6-core Intel Core i5 processor (the highest speed of Turbo Boost 4.1 GHz), 8 GB RAM (2666 MHz) and 256 GB SSD Storage. The new Mac mini model comes with Intel UHD graphics 630 and 3 display support. Now talk of connectivity. It will get WiFi 802.11 AC, Bluetooth version 5.0 support, weight 1.3 kg, and its length-width is 197x197x36 millimeters.